Wildfires near Athens have killed at least 74 people. 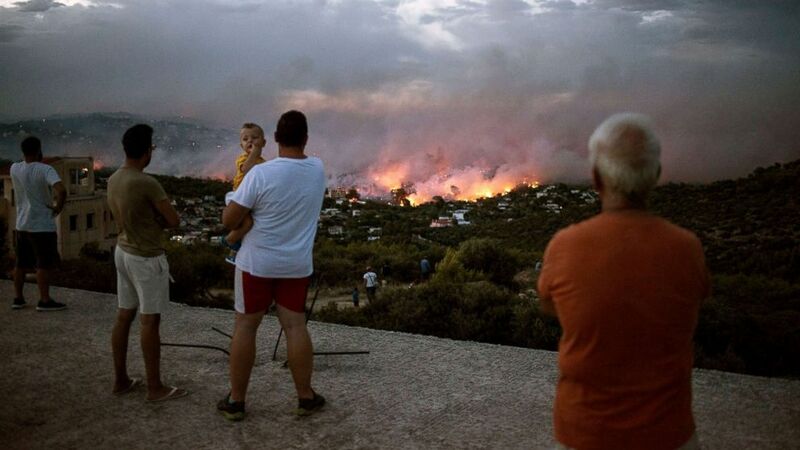 Twin fires raging through Greece have killed at least 74 people as wind-whipped flames swept through forestland, prompting scores of victims to flee to the sea via clogged roadways as they desperately tried to outrun the rapidly spreading inferno. 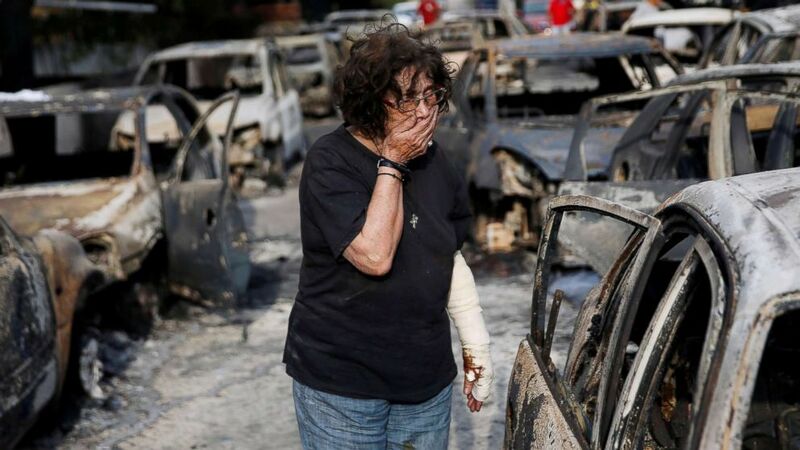 More than 180 people, including at least 23 children, have been injured, and the Spanish government has sent two amphibious planes to help battle the blazes, according to The Associated Press. An earlier report said 150 had been hospitalized. (Valerie Gache/AFP/Getty Images) A firefighter tries to extinguish hotspots during a wildfire in Kineta, near Athens, July 23, 2018. 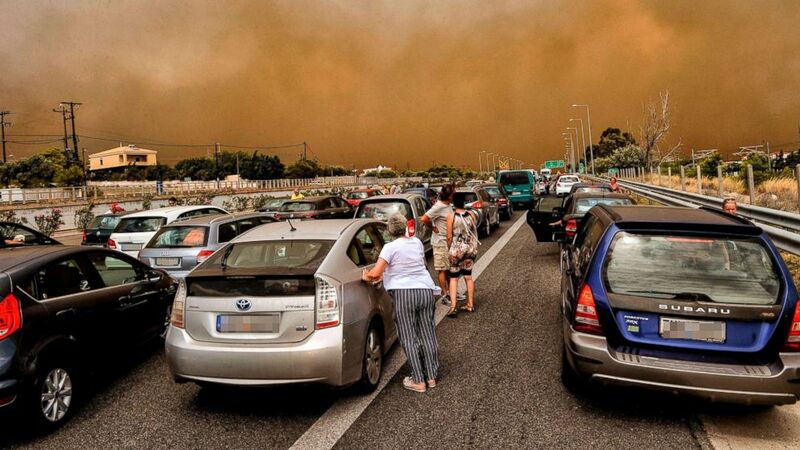 As the fires, which started about 5 p.m. local time Monday, burned out of control on either side of the Greek capital of Athens, cars and farms and forests were torched, with hundreds of people racing toward beaches to be rescued by boat. 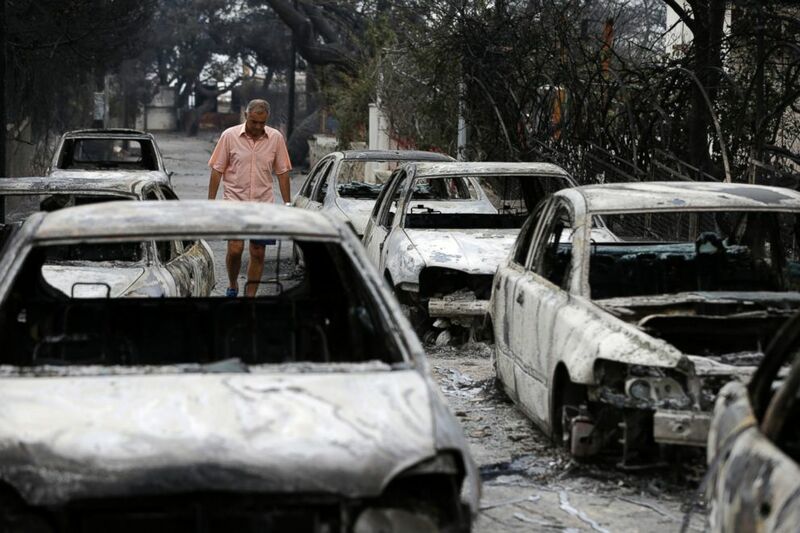 (Valerie Gache/AFP/Getty Images) Cars are blocked at the closed National Road during a wildfire in Kineta, near Athens, July 23, 2018. The death toll jumped to at least 74 Tuesday, according to fire officials. Of the more than 160 adults injured, 71 were hospitalized and at least 10 had to be intubated, fire officials said. Another 23 children have been treated by medics and 11 of them were hospitalized. A search-and-rescue team, made up of 130 Armed Forces personnel and firefighters, combed the hard-hit areas of Voutsa, Mati and Rafina looking for victims, officials said. 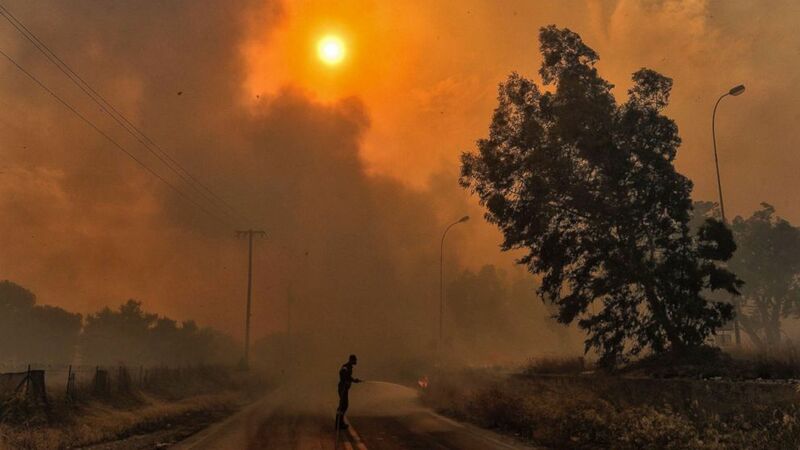 The fires are a "national tragedy" and a "biblical disaster with human losses,” Greek Interior Minister Panos Skourletis told Sky News. (Angelos Tzortzinis/AFP/Getty Images) People watch a wildfire in the town of Rafina, near Athens, Greece, July 23, 2018. 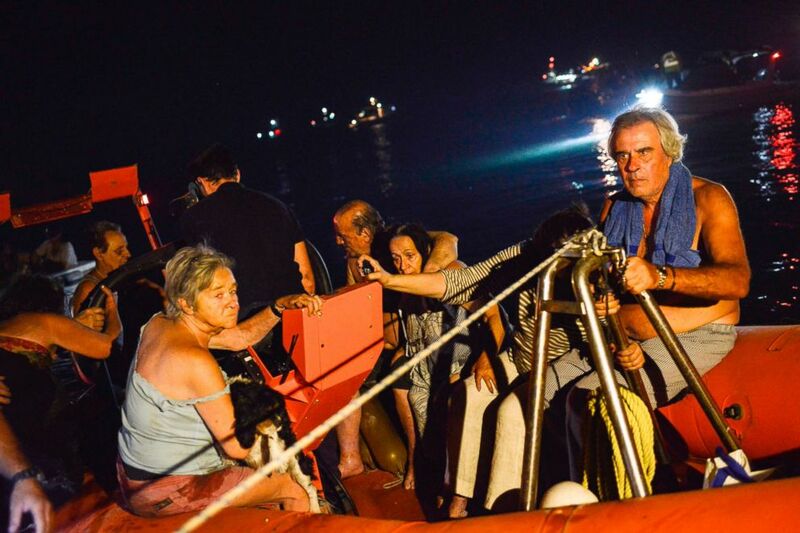 More than 700 people were rescued by the Coast Guard, Sky News reported. (Costas Baltas/Reuters) A woman reacts as she tries to find her dog, following a wildfire at the village of Mati, near Athens, Greece, July 24, 2018. The fires hit during the middle of a heat wave in Greece, where the temperature Monday reached 99 degrees for the second consecutive day. Greek Prime Minister Alexis Tsipras declared a period of national mourning. (Angelos Tzortzinis/AFP/Getty Images) Rescuers and volunteers help local people evacuate the village of Mati during a wildfire near Athens, July 23, 2018. "Today Greece is mourning, and in memory of those who were lost, we are declaring a three-day period of mourning," Tsipras said. "But we mustn't let mourning overwhelm us, because these hours are hours of battle, unity, courage and, above all, solidarity." 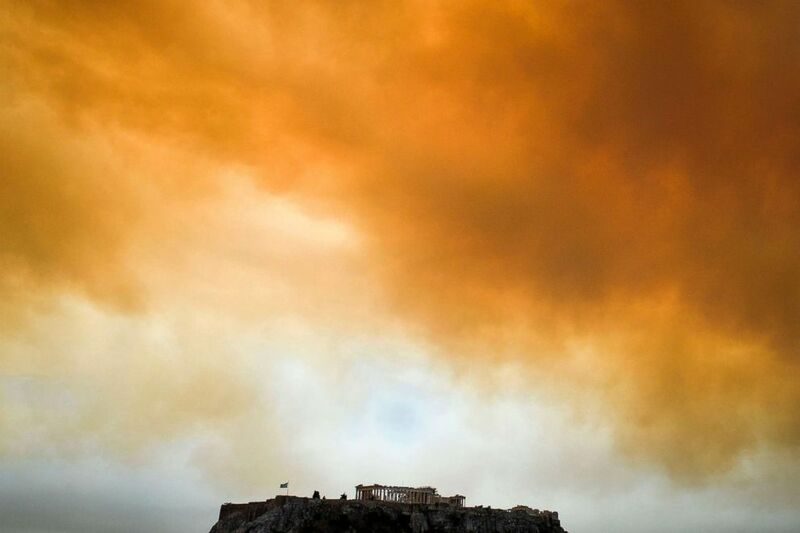 (Angelos Tzortzinis/AFP/Getty Images) The Parthenon temple on the Acropolis hill in Athens is seen as smoke billows in background during a wildfire in Kineta, near Athens, Greece, July 23, 2018. 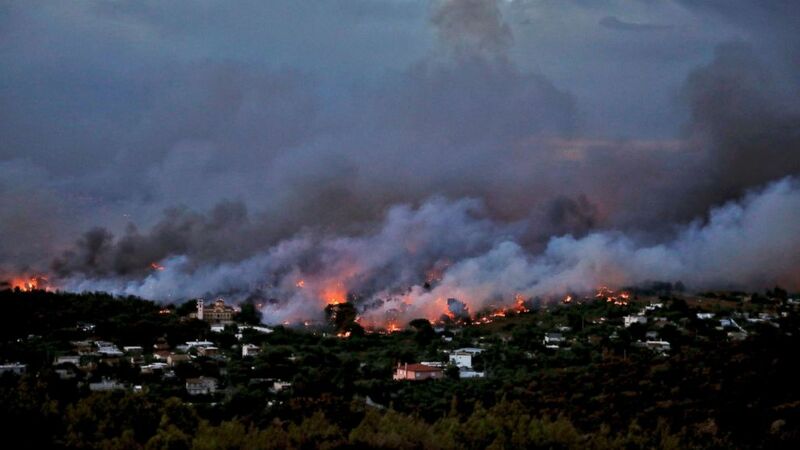 The flames had not reached Athens nor were they threatening any of the famous ancient Greek ruins surrounding the area, officials said Tuesday. Nikos Stavrinidis and his wife grabbed whatever they could from their summer home in the Mati area near Ravina and ran for their lives, he said. 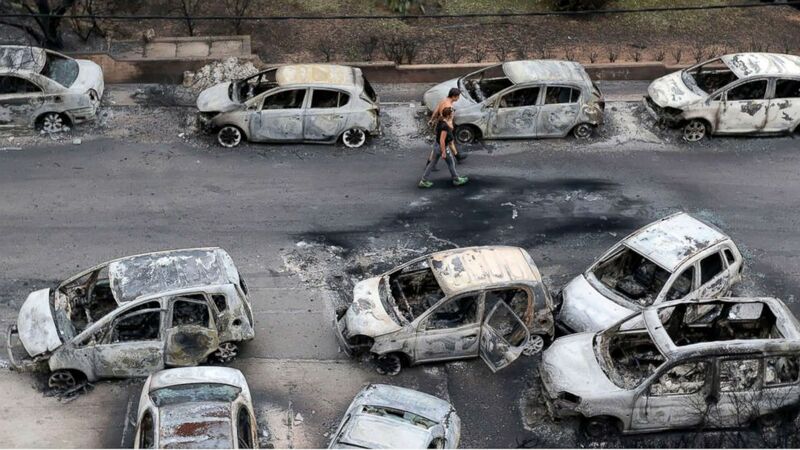 (AP) A man passes burned cars in Mati, east of Athens, Tuesday, July 24. "The fire appeared very quickly,” Sravrinidis told the AP. “The wind was indescribable, it was incredible. I've never seen anything like this before in my life. "We ran and headed toward the sea," he added. "We fell into the sea and tried to distance ourselves, to get away from the carbon dioxide. We went as far in as we could." (Alkis Konstantinidis/Reuters) A wildfire rages in the town of Rafina, near Athens, July 23, 2018. Numerous other evacuees joined him in the water, he said. Trapped between the sea and the burning forests, Stravrinidis said, people drowned in the water. "As we went further, there was a lot of wind and a lot of currents and it started taking us away from the coast. We were not able to see where we were, where Marmari was, where Rafina was, where Mati was. We couldn't see anything," he said of coastal towns consumed by fire and billowing smoke. He and his wife were in the water for about two hours before they were rescued, he said. Turkey has joined Spain in offering to provide aid, including airplanes and helicopters, to Greece. Turkish Foreign Minister Mevlut Cavusoglu said his Greek counterpart, Nikos Kotzias, thanked him for the offer but that the assistance wasn't yet required, the AP reported. Bekir Pakdemirli, Turkey's agriculture and forestry minister, said firefighting planes are "45 minutes away if there is a request and we are ready to intervene immediately." (Christos Doudoumis/Intime/Athena Pictures/REX via Shutterstock ) Dozens of cars destroyed by the blaze in the Mati area, Kokkino Limanaki in Greece, July 24, 2018. Scenes of devastation and death were reported throughout the region. Rescuers said they found 26 bodies "huddled together" at a seaside resort in Mati. People jammed roads and freeways, trying to get away from the fires only to be trapped in their cars by the deadly flames. "The country is going through an unspeakable tragedy," Prime Minister Tsipras said.